Microsoft MVP’s Stephanie Donahue and Mark Rackley will lead a webinar, Feb 21st, on “Transforming Your Organization into a Digital Workplace”. 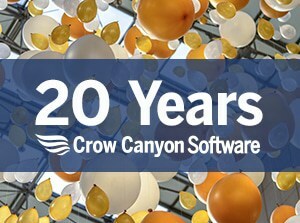 The online webinar, hosted by Crow Canyon Software, is free and open to the public. It will take place Wednesday, Feb. 21, at 11 am Pacific Standard Time, 2 pm Eastern Standard Time. Sign Up here for this webinar. With “Digital Transformation” and “Digital Workplace” being buzzwords of late, Stephanie and Mark will dive into what it takes to actually change an organization into a more efficient operation. Barriers such as outdated legacy apps to support, skeptical stakeholders who can’t envision the benefits, and workforce that must be retrained often hinder the adoption of new initiatives. Using an example of a global manufacturing company that is undergoing a digital transformation using Office 365, the speakers will discuss how to overcome these hindrances. The two MVP’s will help participants learn about the challenges, quick wins, and long-term successes of the manufacturing company, and see how the experience gained there can apply to any organization looking to improve its processes. The webinar will explore simple steps, like moving email to the cloud, and more complex ones such as collaboration with joint venture partners. The event will show that no matter where an organization starts from, a digital transformation with Office 365 is possible. Stephanie Donahue is president of the PAIT Group, based in Cincinnati, Ohio. The PAIT Group helps organizations leverage their investment in SharePoint and Office 365 to get the most benefits from these platforms. She is a frequent speaker at SharePoint conferences. Mark Rackley is a partner and Chief Strategy Officer at PAIT Group and an Office Servers and Services MVP with more than 20 years of experience designing and developing software solutions. Mark is an active blogger, presenter, author (and bacon aficionado) who is eager to lend his real-world knowledge of SharePoint to all who need it. Crow Canyon Software, a provider of SharePoint and Office 365 applications, will host the webinar. Crow Canyon has a range of applications, including Help Desk, Asset Management, Work Orders, Employee Requests, and Onboarding that provide business automation and improve efficiency at companies worldwide. To learn more about Crow Canyon, please visit www.crowcanyon.com.